Marvel has unleashed the third full-length trailer for their upcoming tentpole of summer superhero movies, Spider-Man: Homecoming. In addition to the action-packed new trailer, the studio has also unveiled the final one-sheet poster for the movie. The poster, which can be seen below, brings the cast together and showcases Iron Man flying high, while Vulture and Shocker wreak havoc on the city. The real question may be: why is Marisa Tomei's Aunt May smiling? In the movie, a young Peter Parker/Spider-Man (Tom Holland), who made his sensational debut in Captain America: Civil War, begins to navigate his newfound identity as the web-slinging superhero in Spider-Man: Homecoming. He also tries to return to his normal daily routine -- distracted by thoughts of proving himself to be more than just a friendly neighborhood superhero. Peter must soon put his powers to the test when the evil Vulture emerges to threaten everything that he holds dear. Sony recently announced Spider-Man: Homecoming 2 which is set for release on July 5, 2019. As Peter enters his sophomore year in this summer's movie, fans are speculating that these new Spider-man movies will take a look at various years of Peter Parker while he's in high school. 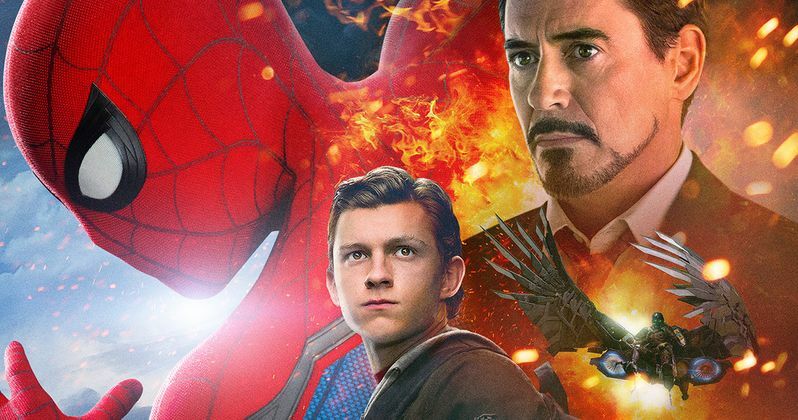 Spider-Man: Homecoming stars Tom Holland, Robert Downey Jr. as Iron Man/Tony Stark, Tony Revolori as Flash Thompson, Marisa Tomei as Aunt May, Zendaya playing Michelle, Jon Favreau as Tony's bodyguard Happy Hogan, Angourie Rice as Betty Brant, Michael Barbieri as Jason Macendale, Isabela Amara as Sally, Kenneth Choi playing Principal Morita, Michael Chernus as Tinkerer and Bokeem Woodbine as Shocker. Sty tuned as there is rumor that an all-new international trailer may be dropping soon with even more new footage. Spider-Man: Homecoming is scheduled to have its premiere in New York City on June 28, 2017, and be released on July 7, 2017, in the United States in 3D, IMAX, and IMAX 3D.